JAKARTA — A landmark Indonesian case that saw an oil palm company fined millions of dollars for burning carbon-rich peatlands has effectively been derailed by a district court on the basis of a simple typo. PT Kallista Alam was in 2015 found guilty by the Meulaboh District Court in Aceh province of using fire to clear 10 square kilometers (3.9 square miles) of land in the Tripa peat swamp on the northwest coast of Sumatra. The company pursued a series of appeals all the way up to the Supreme Court, which upheld the initial ruling and ordered the company to pay an unprecedented 366 billion rupiah, about $26.5 million at the time, in fines and reparations. Its final ruling came in April 2017, at which point the company should have exhausted all avenues of appeal. Later that same year, however, the same district court that had convicted the company approved its petition for legal protection. 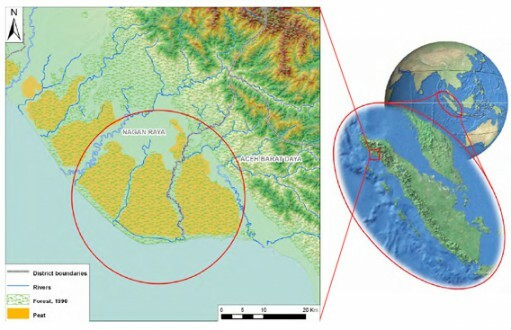 PT Kallista Alam subsequently filed suit against the government, arguing that the coordinates for its concession as submitted by the Ministry of Environment and Forestry in the original prosecution were wrong. In April this year, the Meulaboh District Court ruled in favor of PT Kallista Alam, effectively shielding it from the Supreme Court-ordered fines on the basis of a typo in the original complaint. “The plaintiff, PT Kallista Alam, cannot be made to be legally responsible with regard to the Supreme Court’s verdict,” the court said in its April 12 ruling. The ruling has shocked observers, who had previously welcomed the district court’s 2015 ruling as a landmark decision in the judicial fight against environmental crimes. Activists say they are worried that if the new ruling goes unchallenged, PT Kallista Alam may never pay the fine, and there will be no funds for the restoration of the destroyed area in Tripa, deemed to be critical for the future of the critically endangered Sumatran orangutan (Pongo abelii). Tripa once harbored some 3,000 orangutans in its peat forests, making it one of the most important orangutan habitats in the world, according to Ian Singleton, director of the nonprofit Sumatran Orangutan Conservation Programme (SOCP). “Today we are lucky if there are still more than 100 survivors of its destruction for palm oil,” Singleton said in a statement. 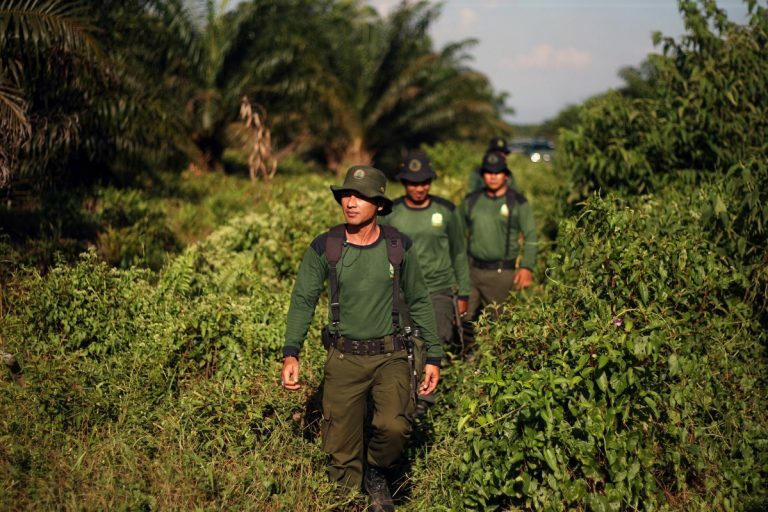 Indonesian forest rangers patrol the part of the Tripa peat swamp forest occupied by oil palm firm PT Kalista Alam in 2012. Photo by Dita Alangkara/CIFOR. While the district court’s ruling hinges on a typo in the original complaint, activists say the new verdict suffers from the same problem — and to an even greater degree. For starters, the official printed verdict misspells the name of the company as “Kalista” instead of “Kallista” on the very first page. It also misidentifies the respondent in the lawsuit as the “Ministry of Environment” rather than the “Ministry of Environment and Forestry.” Indonesia merged its previously separate ministries of environment and forestry in 2014. The ruling also misstates the year of the Supreme Court ruling in the case number, citing it as 1/PK/PDT/2015. That ruling pertains to a separate dispute between two other oil palm companies, PT Indo Agroganda Lestari and PT Eramitra Agro Lestari. The actual Supreme Court ruling against PT Kallista Alam is case number 1/PK/PDT/2017. “That means that the Meulaboh District Court’s verdict doesn’t annul the writ of execution against PT Kallista Alam, because 1/PK/PDT/2015 is for another case,” a coalition of 14 NGOs said in a statement. The coalition argues that the typo in the document number is not merely a clerical error, with the same mistaken case number cited from the start of PT Kallista Alam’s lawsuit. There are also factual errors in the arguments presented by the company during the lawsuit, said Bambang Hero Saharjo, an expert on forest fires from the Bogor Institute of Agriculture (IPB). These errors center on the time when the fires occurred on the concession. PT Kallista Alam claimed it had stopped operating on the concession since November 2011, after being ordered to halt by the Aceh provincial government. “Therefore, the fires in March, May and June 2012 that we were [convicted of] are not our responsibility because activities on the plantation had been stopped [by then],” the company testified as quoted in the district court’s ruling. But Bambang, who inspected the burned area in May and June 2012, said this was not the case. Bambang served as an expert witness in the case, testifying on behalf of the government. The company also played down the damage to the environment, arguing in court that since its permit was revoked in September 2012, a cooperative had taken over the management of the area and successfully grown oil palms there. That was proof, it said, that the land hadn’t been damaged by the fires. It also said that since the concession had been taken over, it would be impossible for the company to restore the land by building reservoirs to rewet the peat soil. IPB’s Bambang refuted this claim as well. Forest clearing and burning still occur on PT Kallista Alam’s concessions in Tripa, according to the SOCP. There were 4,069 hectares (10,055) of new primary forest loss in Tripa between 2013 and 2017. Of that figure, 60 hectares (148 acres) were in concessions held by PT Kallista Alam. Similarly, the VIRS satellite fire detection service identified 2,654 fire hotspots in Tripa, 193 of them in PT Kallista Alam’s concessions. “These observations clearly demonstrate that whilst the legal cases were ongoing and long after fines and prison terms had been meted out, PT Kallista Alam continued to show little or no regard for Indonesia’s National Law,” Matthew Nowak, director of the SOCP’s biodiversity monitoring unit, said in a statement. The government has not taken the latest twist in the legal saga lying down. It lodged an appeal on April 25 against the Meulaboh District Court’s ruling. Jasmin said the company’s legal stonewalling since 2015 had left the ministry unable to collect the fines needed to restore the critical peat ecosystem. He also noted that the sole authority to compel the company to pay lay with the Meulaboh District Court, which has refused to do so. In light of this, the ministry has petitioned the Supreme Court to annul the legal protection granted by the district court last year to the company, Jasmin said. The Supreme Court has not followed up on the petition, but ministry officials met with court representatives last week to press their case. Meanwhile, activists have called on law enforcement agencies to investigate the district court judges who ruled in favor of PT Kallista Alam, slamming their verdict as a clear defiance of the law. “Many are now questioning the motives of the judges in this case, and calling for an investigation into the decision,” HAkA’s Farwiza said. The Indonesian Center for Environmental Law (ICEL) went a step further, demanding the dismissal of the head of the three-member panel of judges, Said Hasan.